Flower color is silver pink and the flowering period is from about June to August. The leaves are green and about 25 cm. high.This plant is suitable for gardens with several (nearly) mature trees and shrubs. Calls for a spot in partial shade and a nutritious, humus rich soil with few roots in the local area. This plant is also used as a border plant (on a slightly sunnier spot). Soil should be moist or well. Gives a good cut flower. This plant is highly regarded by floral designers for the unique umbels of starry flowers, a bit like a refined Queen-Anne's-Lace in effect, but not at all weedy in habit. 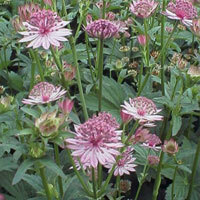 This upright selection has soft lavender-pink pincushion flowers surrounded by bracts of the same tone. It blooms for weeks on end. An excellent filler plant for a moist area in sun or part shade. Also nice in mixed containers or tubs. Flowers may be cut fresh, or dried for winter arrangements. Excellent as dried and cut flowers. Perfect for borders and containers. Fully hardy perennial. The flower color is red and the flowering period is from about June to August. The leaves are green and about 25 cm. high. This plant is suitable for gardens with several (nearly) mature trees and shrubs. Calls for a spot in partial shade and a nutritious, humus rich soil with few roots in the local area. This plant is also used as a border plant (on a slightly sunnier spot). Soil should be moist or well. Gives a good cut flower. The flower color is dark red and the flowering period is from about June to August. The leaves are green and about 25 cm. high. This plant is suitable for gardens with several (nearly) mature trees and shrubs. Calls for a spot in partial shade and a nutritious, humus rich soil with few roots in the local area. This plant is also used as a border plant (on a slightly sunnier spot). Soil should be moist or well. Gives a good cut flower. The colors are red and flowering time is from about June to September. The leaves are green and about 30 cm. high.This plant is suitable for gardens with several (nearly) mature trees and shrubs. Calls for a spot in partial shade and a nutritious, humus rich soil with few roots in the local area. This plant is also used as a border plant (on a slightly sunnier spot). Soil should be moist or well. Gives a good cut flower. 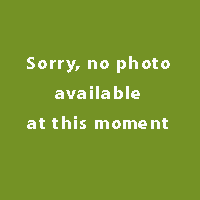 Plants in the garden near trees or shrubs. They tolerate shade and require of prefer a humus rich soil. Plant them for example near buildings or fences. Not too sunny for instance in a darker corner of a border. Suitable for cut-flower. The flower color is dark red and the flowering period is from about June to September. The leaves are green and about 25 cm. high.This plant is suitable for gardens with several (nearly) mature trees and shrubs. Calls for a spot in partial shade and a nutritious, humus rich soil with few roots in the local area. This plant is also used as a border plant (on a slightly sunnier spot). Soil should be moist or well. Gives a good cut flower. The flower color is white and the flowering period is from about June to August. The leaves are green white and about 25 cm. high.This plant is suitable for gardens with several (nearly) mature trees and shrubs. Calls for a spot in partial shade and a nutritious, humus rich soil with few roots in the local area. This plant is also used as a border plant (on a slightly sunnier spot). Soil should be moist or well. Gives a good cut flower. 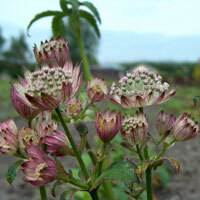 This plant is an exceptionally good cut flower and also attractive in the garden. This selection produces umbels of pincushion-shaped deep wine-red flowers, arranged like spokes on a wheel. Cut fresh or dry for winter display. Midsized in habit, great for the mid border or in containers. Dead-head regularly to promote more buds and to discourage self seeding all over. Performs best when given a rich, evenly moist soil. 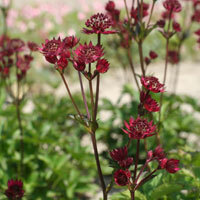 Stunning dark red flowers from spring into summer over mid-green foliage. 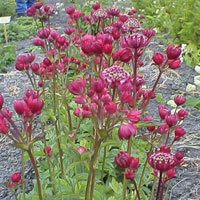 Easily grown in moisture retentive soil in sun or part-shade. A deciduous, clump forming herbaceous perennial. A stunning variety for any border with its beautiful rich flowers.